Project managers for the British Beagle lander program are seeking redemption – on the moon – nearly six years after their spacecraft disappeared on Mars. 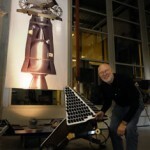 Collin Pillinger who headed the unsuccessful Beagle Mars project is in discussion with the commercial “Odyssey Moon” program to fly a backup version of Beagle’s most powerful instrument on board the Odyssey lunar lander. 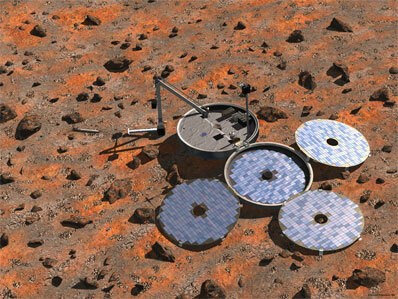 When lost in December, 2003, the Beagle Mars lander was seeking organic materials that could have been evidence of past life. But the Odyssey Moon program is seeking evidence for lunar resources that could be mined by future astronauts seeking profit. The Beagle project’s magnetic mass spectrometer is especially suited for finding such molecules, says Everett K. Gibson a NASA senior geochemist and astrobiologist at the Johnson Space Center. Gibson has led Lunar Beagle studies at JSC, where the lunar version of the spacecraft has been tested. A similar Pillinger instrument is on board a European Space Agency spacecraft headed for a landing on a comet. Years before the Odyssey Moon program came calling, the Beagle Mars program had already converted its backup hardware into a “Lunar Beagle” configuration for a NASA study on low cost robotic lunar concepts. Those study results remain viable and theoretically could result in a NASA Lunar Beagle type mission in several years, says Gibson. Top NASA headquarters personnel disagree, however. The Odyssey Moon commercial lander and rover are under development at MacDonald Dettwiler and Associates (MDA) in Canada using Canadian technology mated with a NASA spacecraft design already tested at the NASA Ames Research Center. Top new U. S. personnel and hardware are also being added. Jay Honeycutt former director of the Kennedy Space Center has been hired as president of Odyssey Moon Ventures, responsible for all U.S. operations and launch programs for the lunar surface venture. He is based near Cape Canaveral. Another major appointment to boost the project’s stature is the hiring of Alan Stern, a highly experienced manager and engineer who was previously NASA associate administrator for science. Another top official is Paul Spudis, previously chief scientist at the Lunar and Planetary Science Institute in Houston. He has just been hired as Odyssey Moon’s chief scientist. The Beagle magnetic mass spectrometer has a strong capability to find and analyze volatile species like hydrogen and water ice and other molecules that would be critical for discovering and using lunar resources Gibson told Spaceflight Now. 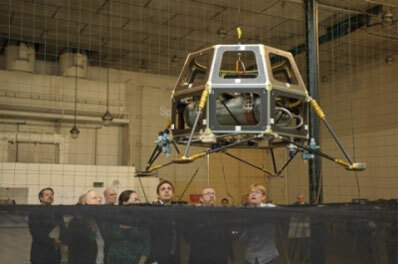 Christopher Stott, a senior executive with Odyssey Moon has held the discussions. Stott was previously a manager with Boeing on the Delta IV and later with Lockheed Martin Space Systems where he helped lead international sales efforts. Further discussions with Stott may be delayed a few weeks, however, because his wife, NASA astronaut Nicole Stott, is set for liftoff Aug. 25 on the space shuttle Discovery. She will be delivered to the ISS for a several month mission on board the outpost. Odyssey Moon is one of 16 competitors in the Goggle Lunar X Prize competition that will award $30 million to the first team to fund a successful commercial robotic lunar landing. The winner must also demonstrate the ability for the mother ship or its rover to drive at least 500 meters (1,650 ft.). The Odyssey Moon team was the first to register for the prize. From all outside appearances at least, it has already amassed a strong investor and engineering team. That includes signing an agreement with NASA for commercial use of a NASA lunar spacecraft that has already been designed and tested at the Ames Research Center. The mission will cost about three or four times more than the prize money. But Odyssey Moon is focused not on just one flight, but an ongoing series that has lunar prospecting goals as well as science objectives. Odyssey Moon had been planning to launch in 2011. 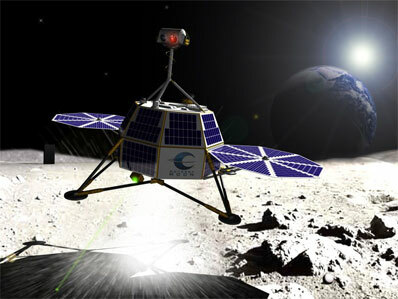 But the company indicates that launch of the first commercial robotic lunar lander “MoonOne” (M-1) will likely slip by a year to at least mid 2012. Use of a Minotaur V or SpaceX Falcon 9 launch vehicle fits with the mission needs, although managers decline to discuss their launcher plans. Either rocket can deliver payloads of 5-50 kg to the lunar surface or 10-200kg to various lunar orbits, Ames studies indicate. He has over 40 years of space experience, including key engineering and simulation positions at the Johnson Space Center during Apollo, Director of the NASA Kennedy Space Center and president of Lockheed Martin Space Operations. Honeycutt will specifically focus on the commercialization of the NASA technology like the new Ames Common Bus lander. This should enable Odyssey to develop a series of robotic landings specialized for specific tasks at different landing sites. 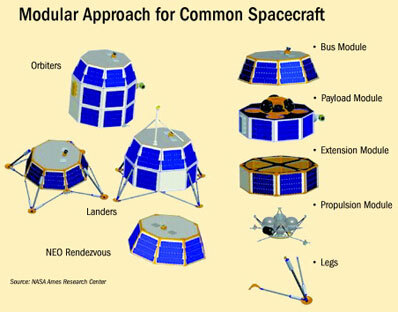 Odyssey’s MoonOne (M-1) lunar lander will use utilize the Ames Research Center design for a modular Common Spacecraft Bus. Under the terms of a Reimbursable Space Act Agreement with Odyssey Moon Ventures LLC, Henderson, Nev., NASA Ames will share its small spacecraft technical l data and expertise with the company. In return, Odyssey Moon Ventures will reimburse NASA Ames for the cost of providing the technical support and will share its technical data from its engineering tests and actual lunar missions with NASA. NASA also will share data from the Ames Hover Test Vehicle, an engineering prototype to evaluate hardware and software systems. 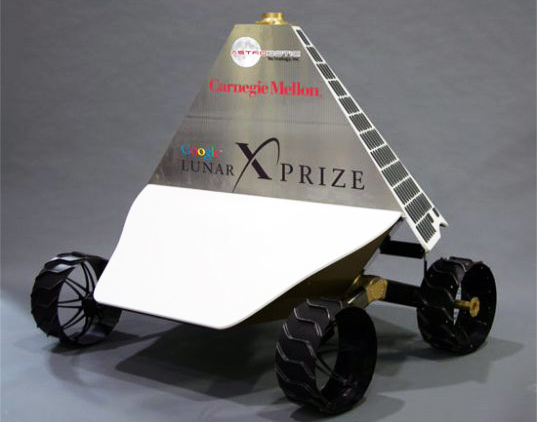 The Goggle Lunar X prize leaves open how each contender achieves 500 meter mobility. The Ames test vehicle, however, has demonstrated that it can not only land, but also rise off the moon and fire small thrusters to move sideways. This raises the possibility that the Odyssey lander can achieve the mobility of a rover, at least to win the $30 million prize and bragging rights that will go with it. The Odyssey Moon venture is domiciled on the Isle of Man “to take advantage of favorable regulatory and export regimes that allow us to choose the best technologies and partners from around the world,” the company says. It is actually headquartered in the U. S. in Henderson, Nevada with offices also in Washington, D. C. as well as the Cape. Pillinger headed the Planetary and Space Science Research Institute at England’s Open University. After Beagle disappeared without a trace a British investigation sharply criticized the project’s management and testing but the spectrometer was not faulted. The first mission will be focused on assessing resources in dark mantle near the lunar equator. The second mission will be to the lunar South Pole and focused on a direct ground level search for water-ice. One potential equatorial target is the moon’s Sulpicius Gallus region where analysis indicates there is extensive dark mantel. The material could produce extensive “feedstock” for the production of hydrogen and oxygen. The region is more than 100 mi. north of the Apollo 11 landing. Another option is Rima Bode, rich in black volcanic glass and thorium. U. S. Geological Survey scientists say that it too could be a major lunar mining area in future decades. The area is near the Apollo 14 landing site. Images taken by the Lunar Reconnaissance Orbiter are helping to narrow other potential landing sites. Odyssey Moon is also extensively involved in support of and use of 45 year old NASA/Boeing Lunar Orbiter imagery. Data from those spacecraft are being to extract major new high resolution data as part of the Lunar Orbiter Image Recovery Project. The program’s CEO, Robert Richards, is the director of Toronto based Optech Inc. the global market leader in the development, of advanced, laser-based survey systems. He also helped found the International Space University. The chairman of the Odyssey board is Ramin Khadmen who helped found Inmarsat and was Inmarsat Chief Financial Officer. Mr. Charles M. Chafer – CEO, Space Services Inc.
Dr. David Miller – University of Oklahoma’s Wilkonson Chair Professor in the School of Aerospace and Mechanical Engineering specializing in the design and test of planetary rovers. If Odyssey Moon carries the Beagle spectrometer, the fact the first Beagle Mars spacecraft “went missing without a trace” are the kind of words that should generate a tremendous amount of “British press.” This could help scientists in the United Kingdom reclaim some luster lost upon British politicians who too often believe the words “British and space” are an oxymoron. 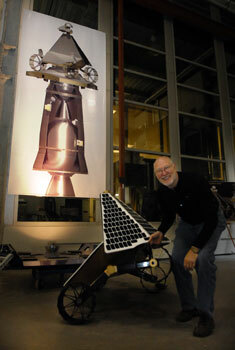 Executives of Astrobotic Technology in Oakland believe they are a bit closer to winning a $20 million race to the moon. 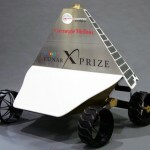 Company Chairman William “Red” L. Whittaker, a Carnegie Mellon University robotics professor, and his colleagues on Monday showed off their third prototype of a robot they plan to send to the moon in May 2011. The winner of the Google Lunar X PRIZE awarded by a California nonprofit that encourages innovation will be the first robot to land on the moon, travel 500 meters on the lunar surface and send images and data back to Earth. Forty years ago yesterday, Apollo 11 astronauts became the first humans to land on the moon. What’s special about this prototype, said Astrobotic spokesman David Gump, is that it should be able to withstand the intense heat a lunar day exerts. “Before we weren’t solving the problem of the robot cooking itself at noon,” Gump said. That’s a particularly significant problem because the Astrobotic team plans to drop the Red Rover robot at Apollo 11’s landing site, which is at the moon’s equator. Temperatures there rise above 270 degrees Fahrenheit. “There’s a lot of heat coming from the sun and a lot of heat bouncing off the lunar soil,” Gump said. The Red Rover will diffuse heat in two ways. First, it will keep a cool side aimed away from the sun to radiate heat off to the black sky, Gump said. Secondly, by using composite structures made from carbon fiber tape and resin, the robot will be able to transmit heat from its hot to cold side more efficiently. Nineteen teams with members from 35 countries are developing robots, said Will Pomerantz, senior director for space prizes for the X PRIZE Foundation in Playa Vista, Calif. Teams must be at least 90 percent privately funded. To collect the full $20 million, the goal must be achieved by Dec. 31, 2012. Whittaker credits the nature of the contest. He likens it to the $25,000 Raymond Orteig offered for the first nonstop aircraft flight between New York and Paris, which Charles Lindbergh won in 1927. That’s what’s about to happen once the Lunar X PRIZE teams figure out how to reach the moon without the help of NASA, said Bob Richards, CEO of Odyssey Moon, an Isle of Man company working to commercialize lunar travel. Plans are under way for humans to return to the moon “no later than 2020,” says NASA. And if and when it happens, people may remain there forever. As a permanent outpost for humans, the moon may become not only a destination for science and exploration, but also for economic endeavors, including mining of platinum-based metals or collection of helium-3 for fusion-energy reactors back on Earth. In time, the moon will have its own transportation system, energy grid and housing plans powered by solar-panels with fuel centers to provide rocket fuel for daily blastoffs to Earth and Mars. Projections wax and wane about when people will revisit the moon and what will happen when they do. 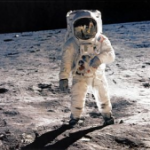 What do you remember about the July 20, 1969 moon landing, and what do you think of the U.S. space program’s evolution since then? Comments in our reader forum. But the NASA Authorization Act of 2005 has established a program to develop a sustained human presence on the moon, with an emphasis on “exploration, science, commerce and U.S. pre-eminence in space.” That program will serve “as a stepping stone to future exploration of Mars and other destinations” throughout the solar system. NASA’s Web site says work on the moon will enable eventual settlement, with an emphasis on lunar activities that hold a direct benefit to life on Earth. Human settlement of the moon represents an even bigger step for people and a more humongous leap for humankind. And people now are preparing to make that leap. William “Red” Whittaker, Carnegie Mellon University roboticist and chairman of Astrobotic Technology Inc., holds a robot-centric view of the universe and says robots will work for years preparing a lunar landing base, energy infrastructure and housing before humans return there. He believes humans will return in about 2022. David Gump, Astrobotic president, said the company hopes to send a robot to the moon and win the $20 million Google Lunar X Prize in May 2011. Eventually it will send other robots to explore the moon, prepare the way for humans and mine valuable resources. The first people to return will share the moonscape with a troop of robots doing excavation, among other chores. A lunar colony could be situated on the rim of a crater, possibly the Shackleton Crater at the moon’s South Pole, where, theories hold, water may exist. NASA says the lunar South Pole has elevated quantities of hydrogen, which could be in the form of ice. The South Pole also has areas with greater than 80 percent sunlight and less extreme temperatures. That first human habitats could be an inflatable structures already in development, or robot-built habitats buried under moon dirt known as regolith. Such a structure below the surface would protect people against solar and cosmic galactic radiation that can cause cancer, cataracts, acute radiation sickness, hereditary effects and damage to the central nervous system. A long-term plan would involve transforming lunar lava tubes — tunnels created by lava flow — into underground homes for people. Robots could explore lava tubes long before humans arrive. Constructing walls and protective doors would make it possible to fill the lava tubes with oxygen and create moderate temperatures. As for a landing site, Dr. Whittaker and Mr. Gump said robots could position rocks to provide a landing pad and prevent high-speed blasts of regolith during touchdowns and liftoffs. Robots also could build a horseshoe-shaped bank of regolith around the landing pad to protect habitats, people and equipment from flying regolith. Solar panels would provide electricity. A fuel station would use electrolysis to divide lunar water into liquid hydrogen and liquid oxygen to power rockets. Oxygen generators would sustain human life. On the moon, astronauts would use smaller vehicles to cruise the outpost and larger ones for long-distance travel and exploration. Once settled, humans could explore and mine. Helium-3, a gas rare on Earth but common on the lunar surface, can be used in fusion energy with no radioactive risk or threat of global warming. Mr. Gump said one large shuttle-load of helium-3 from the moon could meet Earth’s total energy needs for a year. Also, the moon would be a low-gravity base to send astronauts to Mars and elsewhere in the solar system. The moon’s perfect vacuum also would allow for easy production of drugs that require expensive vacuum chambers on Earth. Dr. Whittaker said humans always have found ways to survive in unusual environments, be it the New World after 1492, Antarctica throughout the 20th century or current efforts to survive at the bottom of the ocean or atop high mountains. The South Pole in Antarctica could serve as a model for international cohabitation of the moon. Reaching ever deeper into the future, Mr. Gump said space travel may become as common as airplane travel today. By 2040, humans likely will be on Mars. So in decades to come, he said, human lunar outposts could expand into ever larger domed areas filled with oxygen and featuring entertainment, housing and business. It would be a futuristic scenario with humans donning wings to fly inside the dome. It’s a bird. It’s a plane. It’s a superhuman display of our ability to adapt.